Bowers & Wilkins has announced the Zeppelin Air, a new addition to its iconic Zeppelin speaker range. 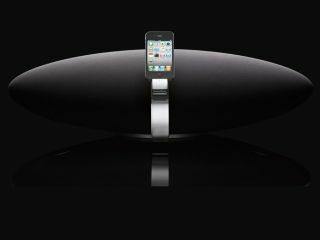 Bowers and Wilkins claims that the Zeppelin Air is the first premium wireless iPod speaker with AirPlay capabilities. Music from your iTunes account can be streamed from a computer to the Zeppelin Air, while your iPhone, iPad or iPod Touch acts as the remote – alternatively, you can stream music directly from your mobile device. As well as doing away with the need for wires, the Zeppelin Air also offers improved audio thanks to updated drive units, five specially designed amplifiers and improved bass reproduction. It may retain the classic airship-inspired shape, but the speaker does feature some minor stylistic upgrades, namely a smart black back-plate and a new-style iPod docking arm. Out in the UK in March, the Zeppelin Air doesn't come cheap at £499.99; that's £100 more than the AirPlay-less original.